The international development bill passed its third reading in the House of Lords on Monday and will now receive royal assent. Britain met the 0.7% target for the first time last year when it spent £11.4bn – or 0.72% of its GNI – on overseas aid. The 0.7% commitment was established by the UN in 1970. In 2013, only five other countries – Sweden, Norway, Luxembourg, Denmark and the United Arab Emirates – had met or exceeded the 0.7% aid spending target. The Netherlands had consistently met the target, but fell short in 2013. The question, though, is what proportion of the 0.7% will finance various jobs programs for UK (and other Western) nationals working in the global development industrial complex (or in other sectors that benefit from tied aid) versus actually going to poverty alleviation in the developing world. 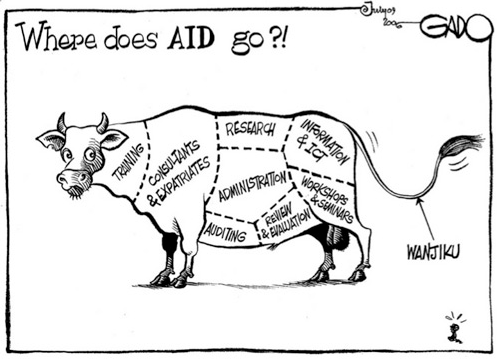 Developing countries seem to think that the more goals there are, the more aid money they will receive. They are wrong. The SDGs are unfeasibly expensive. Meeting them would cost $2 trillion-3 trillion a year of public and private money over 15 years. That is roughly 15% of annual global savings, or 4% of world GDP. At the moment, Western governments promise to provide 0.7% of GDP in aid, and in fact stump up only about a third of that. Planning to spend many times the amount that countries fail to give today is pure fantasy. The backers of the SDGs concede from the outset that not all countries will meet all the targets—an admission that robs the goals of the power to shame. The MDGs at least identified priorities and chivvied along countries that failed to live up to their promises; a set of 169 commandments means, in practice, no priorities at all. A set of 169 commandments also means fundraising opportunities for everyones’ pet issue. But it also means extra meetings, workshop, and clueless tied aid expats consultants for developing country Civil Servants to deal with; and little time for the boring things that actually contribute to sustainable improvement of human welfare.